It’s rivalry week at the IPL now, with all the return fixtures taking place in the second half. Undoubtedly, the return clash everyone would be looking forward to is between KXIP and RR. As it was three weeks back when R Ashwin ‘mankaded’ Jos Buttler, which started a winning streak for KXIP. The world of cricket was left divided on R Ashwin’s mankading of Jos Buttler. But it left a sour taste among the fans of RR for sure as post Buttler’s dismissal, RR collapsed. And they have managed to just win two out of their seven games so far. Another defeat tonight and they would be mostly out of reckoning as far as a spot in the playoffs go. KXIP have had a mixed season which has been highlighted by the ‘mankading’ incident. KL Rahul, Chris Gayle have been their stars with the bat, but the middle-order has failed to click. And apart from Mohammed Shami and skipper R Ashwin, overseas players like Hardus Viljoen, Andrew Tye and Sam Curran have been very expensive. The atmosphere will be electric and there will be an air of tension considering the events from the previous encounter at Jaipur. It promises to be one close game, and RR come into this game high on confidence after defeating a much-fancied Mumbai Indians. Considering the conditions on offer, the game-changer from a fantasy cricket point of view should be someone who would be around for the most part and contributes lot of points for the team. In that regard, Rajasthan Royals opening batsman Jos Buttler is the game-changer from a fantasy cricket perspective. He has been the sole reason for RR’s two wins this season. His belligerent batting against MI especially in the over against Alzarri Joseph where he took him for 22 runs is enough testament of his form. Buttler should be the perfect choice for captain for all fantasy team owners. He opens the batting; most likely he stays in for at least ten overs if not more. And he doesn’t waste too much time, going about manoeuvring the field and finding the boundaries at will. Buttler is very safe behind the stumps, but he has proved his worth fielding at the boundary when Sanju Samson takes the wicket-keeping gloves. RR’s skipper Ajinkya Rahane smartly utilizes Jos Buttler in crucial positions like long on or long off. And he proved his worth as a fielder as well, taking 3 catches in RR’s win over MI. Overall, Jos Buttler has amassed 288 runs in 7 games at an average of 41.14 and strike-rate of 153.19. From a fantasy point of view, what would provide the greatest number of points is the fact that he has hit 37 boundaries and 12 sixes so far. 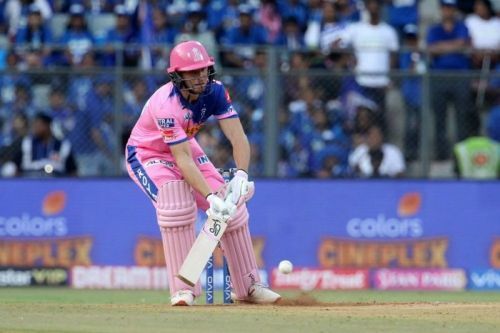 If Jos Buttler has the kind of night he had against MI, then he would be the single reason for RR triumphing over KXIP. And he would need no further motivation tonight, than to face R Ashwin again post the ‘Mankading’ incident. KXIP winning depends on how early they can dismiss Jos Buttler. Follow Sportskeeda for all the updates on IPL 2live score, purple cap, points table, schedule, news, orange cap and fantasy tips. IPL Fantasy 2019, Match 25, RR vs CSK: Who would be the X-Factor in today's game? IPL Fantasy 2019, Match 12, CSK vs RR: Who would be the X-Factor in today's game? IPL Fantasy 2019, Match 27, MI vs RR: Who will be the X-Factor in today's game? IPL Fantasy 2019: Match 24, MI vs KXIP; Who would be the X-Factor in today's game?